Wow, it’s the end of the year already! And as per tradition, we’ll be making dozens of bold resolutions with the main intent of turning into better versions of ourselves. But instead of paying for a gym membership you probably won’t have the time to go to, or dealing with another failed diet, I encourage you to start your change at home! After all, the way our home looks and feels can have great effects on our life. A cluttered home can make us feel overwhelmed and depressed, whereas a clean space decorated in a tasteful way will certainly have a more positive and inspiring influence. And when it comes to clean and inspiring homes, no-one does it better than the Scandinavians. Here’s what you can learn from them. Scandinavian is a style that’s characterized by simplicity and lack of visual clutter. With that being said, it doesn’t mean that you should strip your home free from any décor. In fact, Scandinavian design dictates that all displayed items should be functional and help tie the complete look together. In other words, quality is always better than quantity. For that reason, Scandinavian designer home decorations usually serve another purpose besides visually adorning the space. Try to look for beautifully designed vases, mirrors, scented candles, soft throws and pillows to help you enhance your home in functionality and style as well. 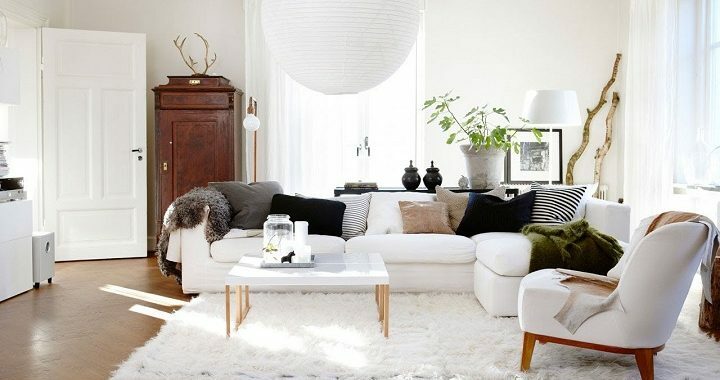 Scandinavian works so well due to the fact that it uses a soothing colour palette that’s dominated by white. White works so well due to the fact that it can visually enlarge the space by accentuating the presence of light. Clean white walls are used as a canvas upon which you can add neutrals and accents of other colours. This means that even if you incorporate only a few décor pieces if they’re well-chosen they will certainly stand out due to the crisp white backdrop. In order to give your space a genuine Scandi vibe, make sure to bring in some luscious plants. Greenery can help bring down the barriers of your home and let in some of the fresh outdoors. After all, don’t we feel most relaxed and recharged when in the company of nature? Whether you opt for rubber plants, cacti, succulents or even a small palm tree – paired with stylish pots, plans can bring some colour and vibrancy to your space. It’s said that beauty is in the details. To go with the naturalistic theme of Scandinavian, make sure to incorporate metallic touches. Designer home decorations made of metals such as brass or copper have a timeless elegance to them and a shiny finish that can be the spark your space needs. Whether it’s a brass vase, copper lighting fixtures, coat hooks, reading lamps or other décor pieces – you cannot go wrong with metallics.